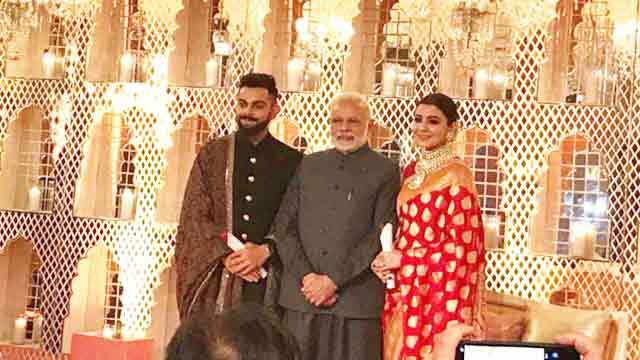 Dhaka, Dec 22 (Just News): Indian Prime Minister Narendra Modi attended the Delhi reception held for Anushka Sharma and Virat Kohli yesterday, reports NDTV. Anushka and Kohli, who married in Italy on December 11, visited Modi Wednesday to invite him. The reception venue was Durba Hall, Taj Diplomatic Enclave in New Delhi. Anushka was resplendent in a gorgeous red and gold Sabyasachi benarasi sari. Kohli on the other hand complemented her in black textured bandhgala with silk kurta and hand embroidered pashmina shawl.